I'm sure by now you've seen a billion testimonies about how essential oils are the best thing since sliced bread. People are talking about how they use essential oils for cleaning, healthcare, aromatherapy, pets, disease treatment etc etc. You've no doubt also taken a look at these products are realized just how much money it costs for some of these 'starter kits'. I've seen some that were almost $200! Ouch! So, how can you get started with essential oils without spending a ton of money? There is a much cheaper way to get started with EOs! Not only is it cheaper to start, but you'll also find out if you really like and use them before you end up stuck with a 30 oil kit. 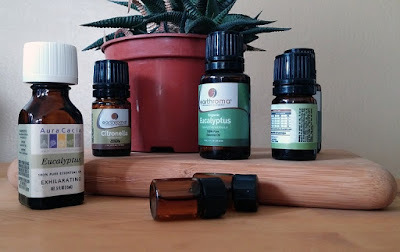 It was quite by accident but my first 3 essential oils happened to be 3 of the most popular and common ones! I think though, that this gave me a certain level of confidence being that there was so much information on these EO's and their uses readily available. The first one I started with was Tea Tree Oil. My step-sister had raved about it and I decided to give it a try. This was probably 18 years ago! I buy this one now. You can read here about how I used it on foot fungus last year. I've also used this for cleaning and my husband uses it on acne. I use tea tree oil a lot so it makes sense for me to buy a larger bottle. I then bought a bottle of lavender essential oil. I use lavender aromatherapy at bedtime. The scent of lavender is so relaxing it puts me right to sleep! I used this to make candles for the bedroom and some lavender scented, rice filled eye pillows for bedtime. This one was also a larger bottle since I use it for candles and make a dozen or so at a time. Next I ventured into peppermint oil. I bought a large 4oz bottle with the plan of using it to make foot soaks and lip balms for Christmas gifts. I knew I was going to use a lot! In addition to making beauty products with it though, I have also used it for nausea, in my headache relief blend and for exhaustion. Eucalyptus: Decongestant, uplifting scent, stress and muscle soreness. Lemongrass: Soothes muscles and ligaments when applied topically. Sweet Orange: Uplifting scent, antidepressant, antibacterial. Rosemary: Improves memory, lowers stress, relieves headache. Peppermint: Boosts energy, headaches, sharpen memory. French Lavender: Relaxing, helps to induce sleep, bug repellant. Most of these oils have other uses, but those are the ones that interested me. I like to use them in this diffuser/humidifier that I keep on my desk. I also keep a container of Sweet Almond Oil on hand to use as a carrier oil when I want to apply them topically. I sometimes use coconut oil also. 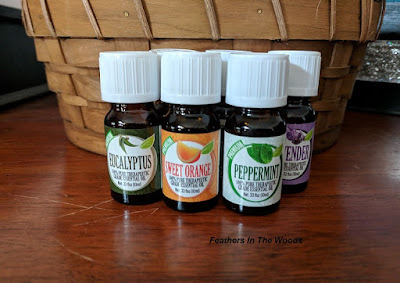 Of course there are many more carrier oils to pick from, they just happens to be the ones I usually have. I've enjoyed experimenting with these different oils and I believe I may be ready to try a few more. I think I will go for lemon next. Lemon is excellent for household cleaning! I found that certain oils are naturally cheaper to make and so a large bottle can be quite affordable. I have bought pretty much every brand out there and have to admit that I have seen almost no difference between them. I like to order from Lucky Vitamin online and they have different brands of EOs to choose from. Watch for sales or discount codes. I'm currently waiting on an order from Barefut essential oils, so I'll let you know how those are when I get them. 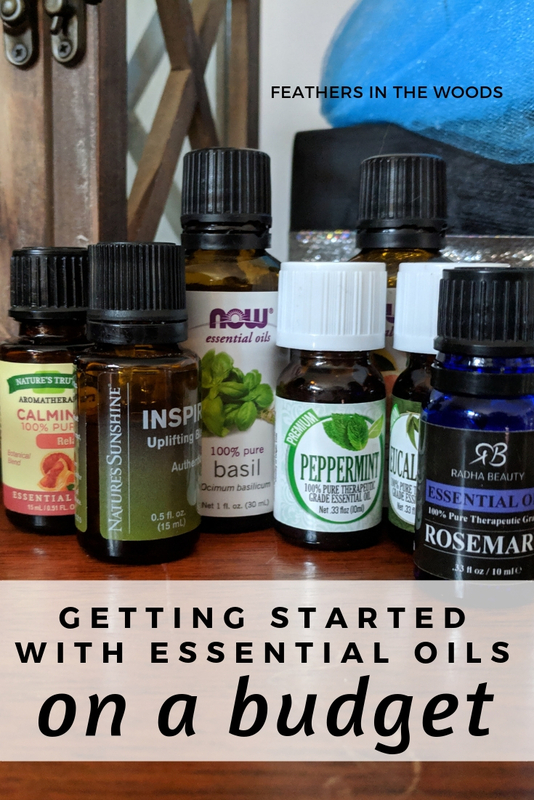 I have found lots of great sets of essential oils on Groupon and individual bottles from well known brands like Aura Cacia in TJ Maxx or Marshalls. A word of caution: when buying essential oils do not be confused by fragrance oils...they are very much different but some people get confused because they're packaged to look alike. They will say right on the bottle/box which one it is! Sometimes it says aromatherapy oil, in which case just assume it's a fragrance oil unless it also says essential oil or the ingredient list says otherwise. Most essential oils should not be applied to your skin unless mixed with a carrier oil. Generally a 1 drop EO to 1 tsp carrier oil ratio is acceptable. Do not ingest essential oils. There is no need to take essential oils internally....anyone telling you otherwise is selling something. More expensive does not necessarily mean better. There are a LOT of different opinions on how, when and why to use essential oils. When choosing an oil and it's uses do plenty of research and use common sense. If it seems to good to be true, it probably is. While I believe essential oils are very useful I also think that jumping in too quickly and spending tons of $$ can be counterproductive. You don't want to burn yourself out or get overwhelmed before you really get started! I think that starting small with 1 or 2 individual oils and judging whether this is a good fit for your lifestyle is the smarter option. Please, please don't fall for the hype with any brand telling you that only their brand is the best! That is a marketing ploy and many independent reviews have been written comparing EO's of various brands and price points. Cheaper is not worse and more expensive is not always better! Do some research and pick a brand that fits your budget! Once you have determined that you can and will use EO's daily then it's time to look at multi oil kits and even start using essential oils to make your own health products! Want to read more about taking care of your health naturally? Click here for my other posts on natural healthcare! I love this! So many people don't know where to start or are afraid it is too expensive. The money i invest into oils has definitely helped me save in terms of other medicines and doctor bills. Thanks for sharing this on the Homestead Blog Hop. I hope we see you again today. I love the ideas you put forth in this post!!! I really want my readers to know about this too! I want to share this in my weekly series called "Roll Out The Red Carpet Thursday" - I share bloggers' amazing posts that I've found during the week. I hope that' ok! Have a great night!